Ant Parker’s busy animals give you so much to look at. Slide open the windows: peep through. A feast of novelty fun filled with buildings, vehicles and animals. Tweak the lift-up panels to see a whole town at work. Meet the Zebra family, Doctor Dog, Fireman Fox and their animal friends. 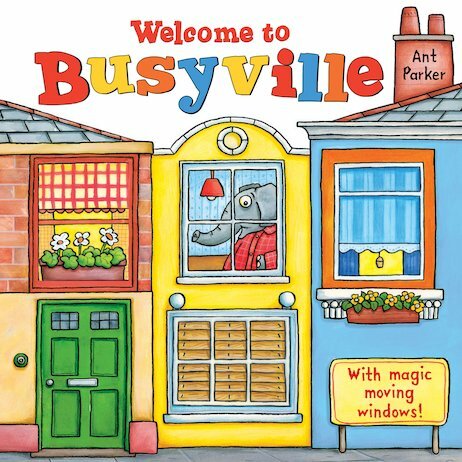 Visit Busyville Hospital, explore the high street and stop off at the garage. 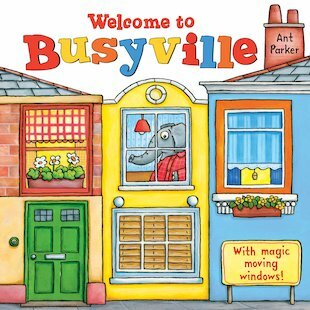 We think Ant Parker’s bright, busy interactive scenes are half-way between Richard Scarry and Nick Sharratt. (Two of our favourite ever artists.) Who could say no to that? Ant Parker is a popular artist who turns his talents to both picture books and pre-school novelty titles. He enjoys worldwide success and his most recent titles include Macmillan’s ‘Charlie the Chicken’ and ‘Desmond the Dog’.